One factor that often disappoints new guinea pig owners is how skittish and standoffish their new pets are. Guinea pigs in unfamiliar surroundings spend most of their time hiding or watching humans; most will react to hands swooping into the cage with blind terror. However, with care, you can build a more affectionate relationship with your cavy, and speed the bonding process. The problem with guinea pig affection is that to earn it, you have to overcome his evolutionarily ingrained instincts. In the wild, guinea pigs are prey animals, and their standard response to almost any unfamiliar stimuli is terror. To your new cavy, you may as well be a condor saving him for a midnight snack. Teaching him to overcome that fear can be a long but worthwhile journey. One mistake some owners make is not letting their guinea pig settle into his new home comfortably. For the first few days, resist the urge to pick up your new pet, and simply let him explore his cage with as little interruption or disruption as possible. Talk to him and make him aware of your presence when you refill pellet bowls or hay racks and especially when you provide vegetables. You may extend your fingers through the bars to let him sniff and lick your fingertips, getting used to your contact and scent, but beware -- some cavies may mistake fingers for baby carrots and take a nibble. Once he accepts his new surroundings, he will be more receptive to human contact. The old adage "the quickest way to the heart is through the stomach" is especially true for guinea pigs. One of the best ways to get your pet to associate you with good things is by giving him plenty of treats. Bags of prewashed salad mixes like spring mix or romaine lettuce make excellent bribes, since you can hand-feed leaves to your guinea pig during lap time. He may seem suspicious at first, but few guinea pigs can resist delicious snacks. 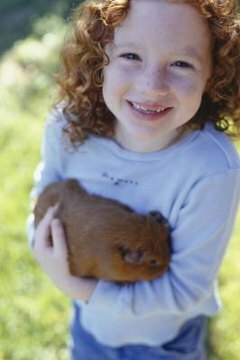 Talking to your guinea pig while feeding him will help him associate the sound of your voice with happiness, and this will help him to accept your presence and grow more affectionate. Once your guinea pig accepts that you are not a predator and are, in fact, the source of tasty snacks, you should see his affection for you grow substantially. At this point, the cavy's personality comes into play. Some become extremely affectionate, enjoying ear rubs and squeaking for attention whenever you come near. Others may seem to accept you only begrudgingly, snatching treats and carrying them off to hide. In either case, the loud chorus of wheeks you receive whenever plastic bags rattle at snack time should give you a good idea of your guinea pig's appreciation for you and the care you provide for him.